They go by many names: open door market, self-service market, automated market, micromarket or kiosk market but they are the same thing—a great new snack and meal opportunity for your workplace. A kiosk market is a free-standing, automated mini convenience store. But unlike the average convenience store stocked with sugar and salt laden processed foods, a Monumental Markets kiosk market boasts a boutique-like display full of healthy foods, drinks and snacks. Our kiosk markets feature the top selling brands of health foods and include vegan, vegetarian, and gluten free options. The focus of a Monumental kiosk market is on healthy snacks and foods. Why is this? Well, because when polled, an overwhelming number of employees state that easy access to healthy foods at workplace vending sites is sorely lacking and it is because of this void that they default to candy, soda and chips as a choice. A kiosk market solves that problem and provides a pleasant atmosphere for employees to purchase snacks and other foods. For free, Monumental Markets will come to your office, shop or warehouse and install a kiosk market appropriate in size and scope to your needs and stocked with exactly what you and your staff want (we can even sneak in a few of those less than healthy favorites, should you wish). 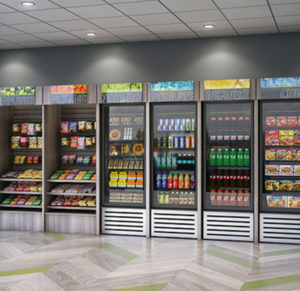 With the combination of weaved baskets, lovely display shelves and modern glass vending cases a Monument Markets self-serve kiosk market will impress even the most hard to please. Installing one of our markets is a perfect complement to your wellness program. And, if you don’t have a wellness program, it is a great no-cost basis for one and will show your employees that you care about their health, their time and their work environment. Your custom tailored kiosk market will offer exactly what you want from healthy sandwiches and salads to premiums snacks, all affordably priced. Speaking of price, our payment system couldn’t be easier. Your employees can pay by scanning a Monumental Market card, an employee id badge, or swiping a credit or debit card. Our fully automated state of the art design means that there are no frustrated employees wondering why their selection has not “dropped” from its position into the retrieval area. With a Monumental Markets kiosk market employees simply pick an item from a basket, shelf, or case, inspect it if they wish, scan it and purchase. Monumental Markets cutting edge technology means there are no errors, incorrect charges or theft. Give Monumental Markets a call so you and your staff can soon begin enjoying the benefits of a fully automated, 24/7 grab and go kiosk market!